Since trying a demo of Azul at Airecon, I've fallen completely in love with this colourful box of wonderfulness from the abstract wing of Plan B Games, Next Move Games. Starting a review with your final thoughts isn't necessarily the best way to go about getting people to read the whole thing, but I have trouble containing my enthusiasm for Azul. It's been to games nights, friends' houses, family gatherings and work and I've still never had players not ask for a second game straight away. 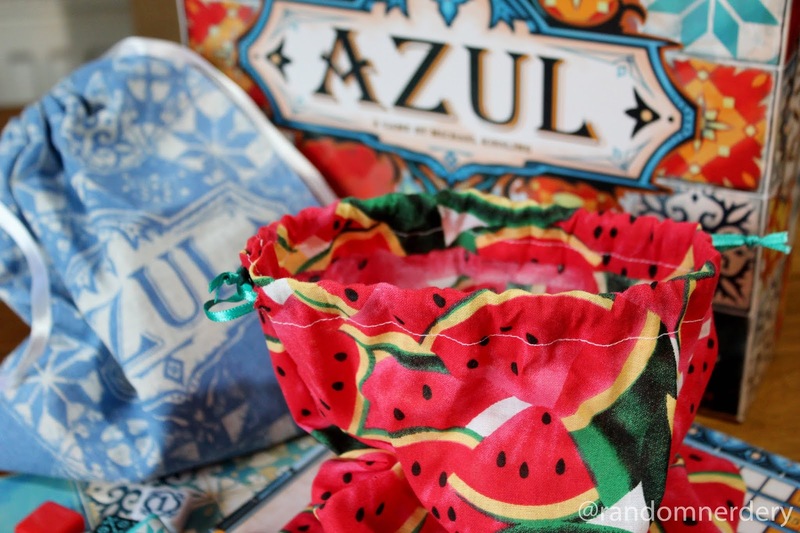 I've basically been carrying the box around with me like an impractical cardboard handbag for the last few months, making anyone who sits still for too long play the game. Since I started writing this (back in March!) Azul has won the prestigious Spiele de Jahres (Game of the Year) award, so plenty of other people are clearly loving the game's simplicity and colour. Designed by Michael Kiesling, Azul is an abstract puzzle game for 2-4 players where we play artisans working in the palace of King Manuel I of Portugal. The King has just returned from a trip to the Alhambra in Spain where he's become enamoured with the beautiful Moorish tile designs and has, in the grand tradition of bosses-returning-from-conferences everywhere, come back with A Good Idea. We're going to be recreating this exceptional artwork for him at home, carefully selecting tiles and positioning them in the most aesthetically pleasing way. Obviously we have to make sure our work meets with the King's exacting standards, but most importantly we want to make sure our wall is better than our co-workers' walls. There's tiling pride at stake here. Nerd interlude: This was the point during my review-writing research (for yes, on occasion I do do some!) that I accidentally fell down a wikipedia rabbit hole searching for background on the Alhambra, its beautiful artwork and how this translated over to Portugal. I ended up reading about 'wallpaper groups', crystallography and a whole bunch of maths that I hadn't planned on, but it seems there are exactly 17 different ways to make a two-dimensional repeating pattern and the Alhambra manages to have examples of all, or almost all of them, depending on which research paper you read. Cool! End of nerd interlude. 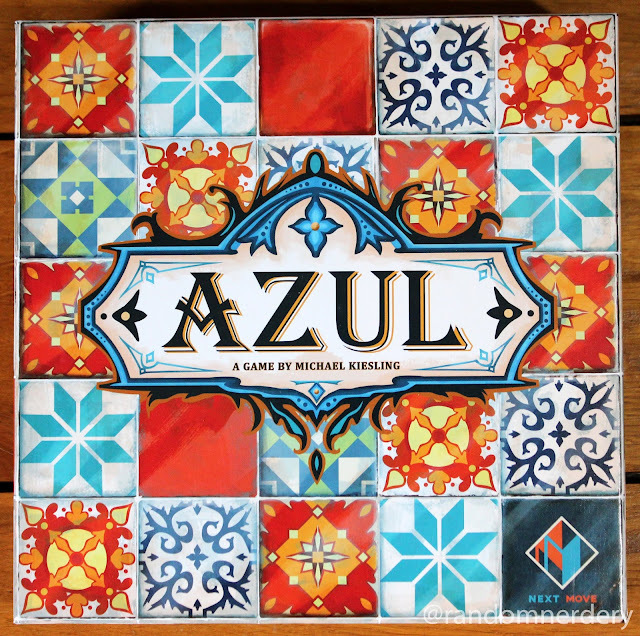 I've heard it said that Azul is theme-less but, whilst at its core it's definitely an abstract game, I think the story fits the game-play really nicely. Perhaps I've gotten too into the tiling spirit! You grab your tiles from factories, line up your pattern to decide what looks good and then stick it onto the wall. If you drop a tile onto the ground, it breaks and counts as negative points. All of this makes sense to me in terms of the theme. You can see a handy score track along the top and the wall we're trying to make on the right, with coloured spaces to show us what can be placed where: a colour can only appear once in each row or column. 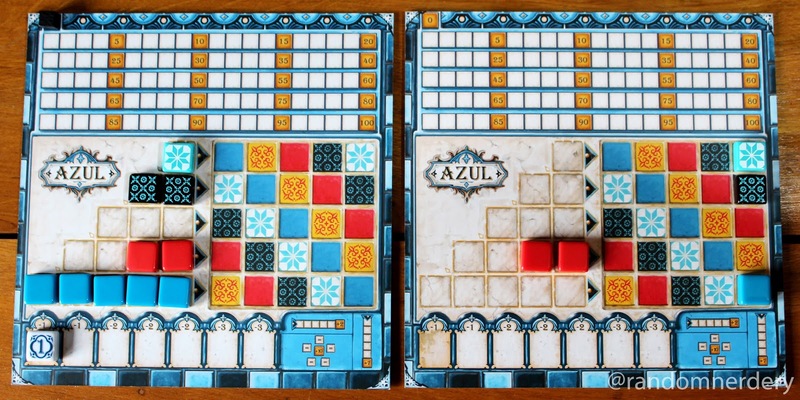 Fallen tiles, or negative points, go in the spaces provided on the bottom left. Factories are represented by a number of cardboard discs in the centre of the table. They hold four tiles each, randomly drawn from the supply at the start of each round. The game takes place over a number of rounds, with players taking it in turns to take all tiles of one colour from a factory. The remaining tiles on that factory are pushed into the middle to form a central pool. This functions a bit like an extra factory that players can take tiles from, but the first person who does so each round has to take the first player marker and put it into their negative points area. Everyone continues to take it in turns choosing until all the tiles are gone. 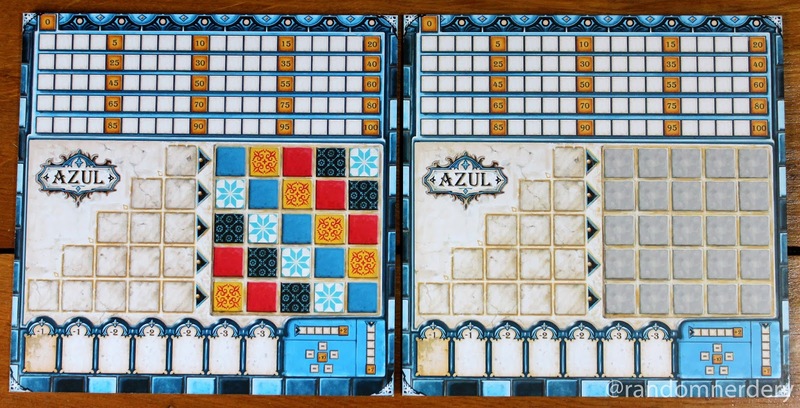 The selected tiles need to be fitted into one of the rows on the left-hand side of the player mat. 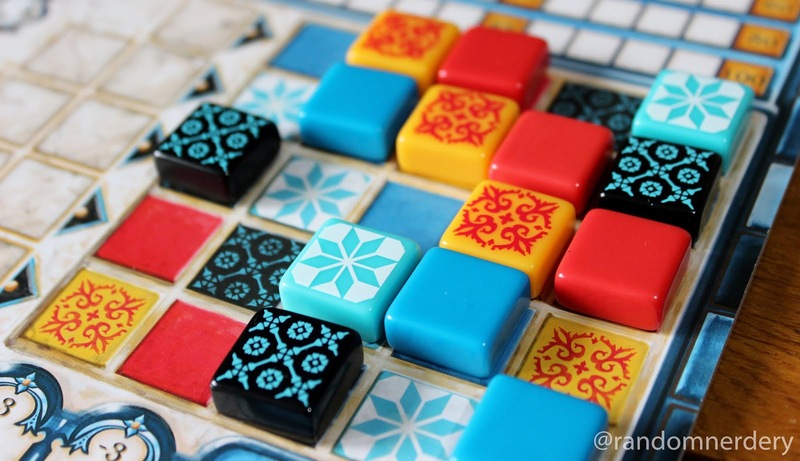 Each row can only hold one colour of tile, so this is where the thinking really begins. At the end of the round, completed rows are scored by moving one tile onto the matching coloured space on the wall and discarding the rest of the tiles into the box. This means you're normally looking to fill as many rows as possible, but you have to balance this with trying not to take too many tiles of the wrong colour - anything that doesn't fit somewhere will overflow into the negative points (floor) area. 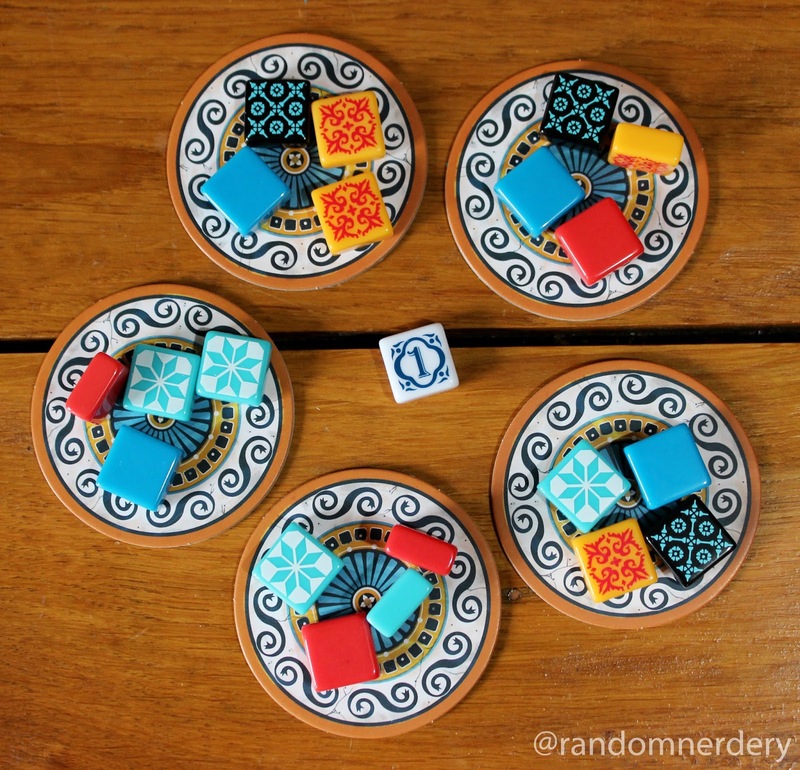 You'll be considering what colours will fit, what would offer the best scoring combinations and, if you're mean, whether you could get something useful whilst forcing someone else to take some negative points. If you're *really* mean you could take something sub-optimal for you purely to force someone into taking negative points! Mean or not, you'll always need to be aware of other people's boards to see what they're trying to collect and how that changes the availability of certain colours for you. The game ends at the end of the round in which someone completes a whole row of their wall, so you're also adding timing into the thought equation to try and ensure that the game ends at a point where you have the potential to win. Points are scored as you go along based on the number of consecutive tiles your newly placed tile is adjacent too, and at the end of the game based on number of completed rows (you can end up with more than one), completed columns and completed sets of each colour. Predictably, most points wins! Much like bowling with no guard rails, the back of the board has a grid with no pre-determined colours, but you still follow the same rules of the original grid - a colour can only appear once in each row and each column. 'How could this possibly go wrong', I thought... 'This is easy', I thought... And then I backed myself straight into a corner filled with stupid red tiles. Any row you mess up in this way goes entirely into your negative points space, so you can guess how well I did in this game! The variant mode doesn't add vast amounts in terms of original game-play but it does give you another dimension to think about, and I enjoyed the added potential for getting things completely wrong. This is the best bit, for me - the laughs that flow when it all goes wrong. The slowly-dawning realisation that someone else has made sure you'll have to take a huge pile of completely useless tiles. Or worse, that you've just done it to yourself without realising. I find it so funny, whether or not I'm on the recieving end of the negative points! 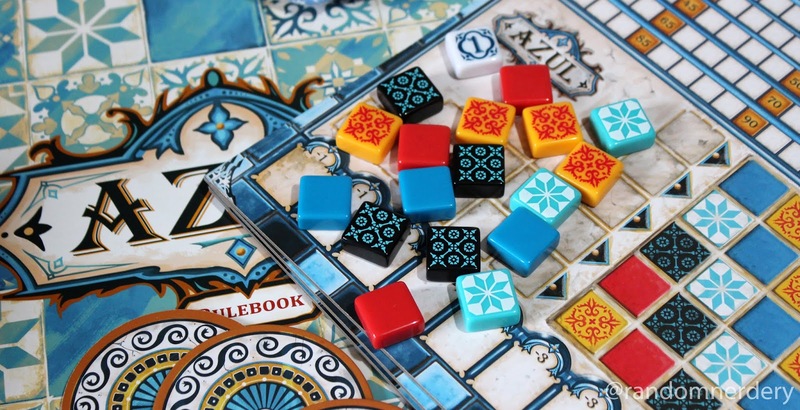 In theory the game doesn't have a lot of player interaction, but in practice it really does, as you laugh together and try to reverse-psychology or Paddington-Bear-hard-stare your opponents into taking the tiles you want them to. Like any game, not everything is perfect. 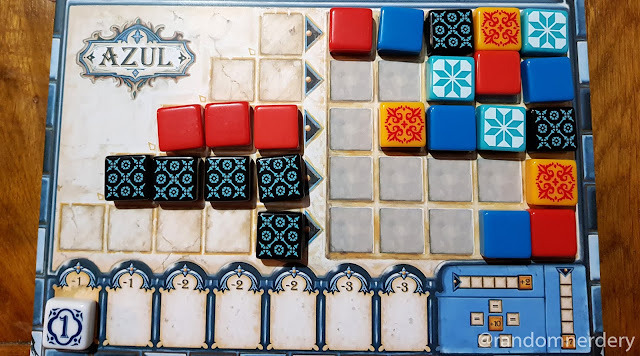 The tiny little score tracking cube is easily knocked off-course and the whole player mat could have benefited from a Scythe-style double-thickness-with-recesses type deal to keep everything safely in place. I've seen a couple of really nice wood or acrylic overlays that people have custom made themselves, but it's a shame this couldn't have been part of the original design - I'm guessing the cost is prohibitive. 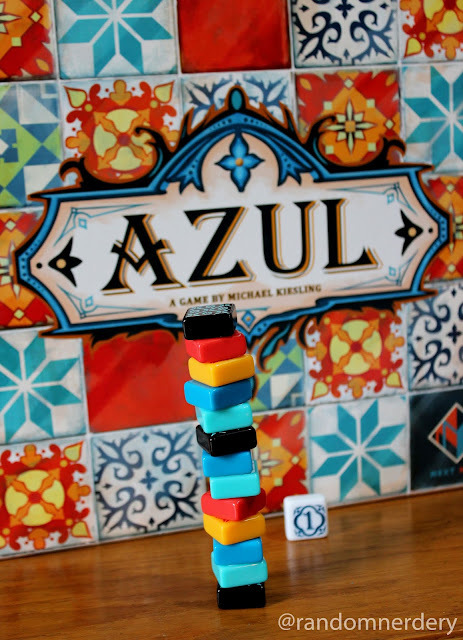 Outside of that niggle, there's no questioning the component quality in Azul. 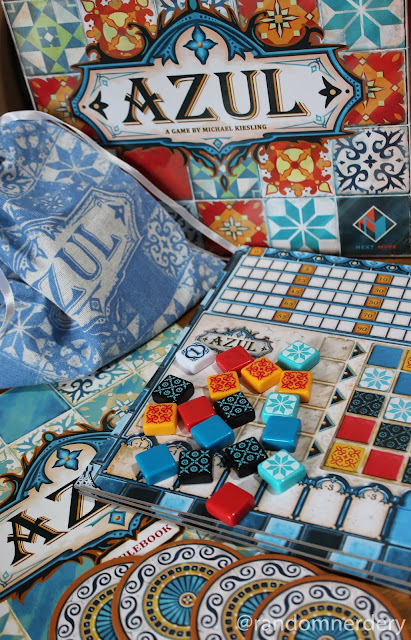 The design is beautiful, the tiles are infinitely satisfying to handle and my reprinted copy even has a nice first player tile which upgrades the original run's rather tragic little cardboard offering.